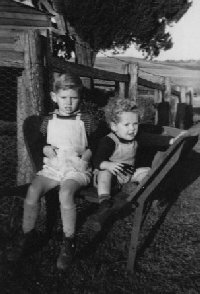 "Rosedale" Carapook was the home of Alan & Amy POVEY and their two boys, Daryl & Bruce from 1941 to 1954. Thomas (or Joseph) Matthews PENROSE and his wife Susanna JELBART were the immigrant parents of this family group associated with Carapook in the 1800's. Susanna JELBART was the sister of Joseph JELBART, who along with his family emigrated from Cornwall, England to Carapook in 1875. The property "Rosedale" on the Bella Vista Road, north of Carapook was home to the PENROSE family c.1870 to c.1900. A PENROSE family with 1 school-aged child, living 1 mile NW of Carapook was marked on the Carapook map but was not one of the signatures to the 1875 petition aimed at establishing a new school at Carapook. At this time it is difficult to identify exactly which PENROSE family group was at "Rosedale" in 1875. William Penrose BEST 1859-1952, b. Branxholme, S-W Victoria, d. Cannington, Western Australia. James BEST 1861-1933, b. Branxholme, S-W Victoria, d. Adelaide, South Australia, m. 1890 Sandford, S-W Victoria to Emma "Minnie" JEFFREY 1855-1945, b. & d. Adelaide, South Australia. Annie BEST 1863-1944, b. Branxholme, S-W Victoria, d. Perth, Western Australia. Elizabeth Alice Jelbart BEST 1866-1925, b. & d. Branxholme, S-W Victoria. Lily May BEST 1870-1934, b. Branxholme, S-W Victoria, d. Cannington, Western Australia, m. 1899 to Edwin Turner MORROW 1870-1940, b. Victoria, d. Perth, Western Australia. 3 children. Sarah Louise BEST 1872-1924, b. & d. Branxholme, S-W Victoria. John Sanders PENROSE, b. 1838, Cornwall was another sibling in this family, but he had died before 1842. Samuel PENROSE, b. 1846, Cornwall was the youngest sibling. He appears to have had two marriages, both in Victoria, the first to Annie O'BRIEN in 1865 and the 2nd to Eliza MOTT in 1875. He had about four children and could have been the PENROSE marked on the Carapook School map of 1875 with one school-age child. One window sill at "Rosdale" had the name Sam PENROSE carved into it. Sam moved to Queensland in the late 1877. His wife Eliza (b. 1850 Adelaide, SA to Joseph MOTT & Eliza WAKEFIELD) died in 1913 at Wallumbilla (near Roma), Queensland, Australia and Samuel died in 1933. They are both buried in the Toowoomba cemetery. Lily May PENROSE, b. 1880, Queensland, d. 1936, Queensland. Howard Jelbart PENROSE, b. 1881, Jondaryn, Queensland, d. 1942, Queensland, m. Christina HOWSE (nee McLEOD) 1868-1935. John Sydney PENROSE, b. 1884, Jondaryn, Queensland, d. 1974, Roma, Queensland, m. Mabel BUDD 1892-1975. Samuel matthew Melbourne PENROSE, b. 1889, Queensland, d. 1946, Queensland. Noel PENROSE, b. 1847, Cornwall was another sibling in this family but had died before 1847.